A new study by RISE and the Swedish University of Agricultural Sciences (SLU) reveals that forest machines start fires – hundreds of fires in Sweden every year. The emergency services in Sweden are called out to an average of 4,500 vegetation fires every year, and about half of these are fires in forests or cleared areas. The fires have many causes of ignition, but three of the ten biggest fires in Sweden in the last 20 years are believed to have originated from work with forest machines on stony terrain. The biggest fire (Västmanland 2014) started during scarification work, affecting approx. 14,000 hectares of forest. The second biggest one was caused by work using a forwarder (Bodträskfors, 2006) when approx. 1,900 hectares of forest were destroyed. The fire in Hassela (2008), when 800 hectares of land were incinerated, was also caused by a forwarder. The issue of the risk of fire from forestry has come to the fore recently, but so far there has not been a proper review of the problem. A new report from RISE and the Swedish University of Agricultural Sciences (SLU) presents an analysis of the emergency services’ call-outs to forest fires over the last 18 years. The incidents were correlated with meteorological data at the ignition site and with a new summary of the presence of boulders on the ground. An interview-based study of forestry contractors is also presented in order to obtain information about more specific circumstances surrounding ignition and about their procedures relating to fire risk and initial fire-fighting measures in the event of fire. (Left) Geographical distribution of forest machine ignition incidents resulting in the rescue service dispatch. (Right) Distribution of the boulder index across the country, areas with abundance of large rocks . The colours indicate what proportion of forest land has large number of boulders, described in more detail in the report. A large part of Sweden’s forests is used for industrial forestry, which involves traffic in which heavy machines drive across large areas of forest. Three main activities take place with forest tractors: clear-felling with harvesters, extraction to the nearest forest road with forwarders and thereafter scarification of clearings improve the success of seedling establishment. During scarification, humus is removed and mineral soil is exposed in continuous strips with the aid of two or three rotating discs. The study shows that every year there are on average 330–480 ignitions from forest machines in Sweden, Figure 2. Of these, 32–37 result in an alarm and fire-fighting measures by the emergency services. Approx. 75% are started in connection with scarification, and the rest are dominated by forwarders. 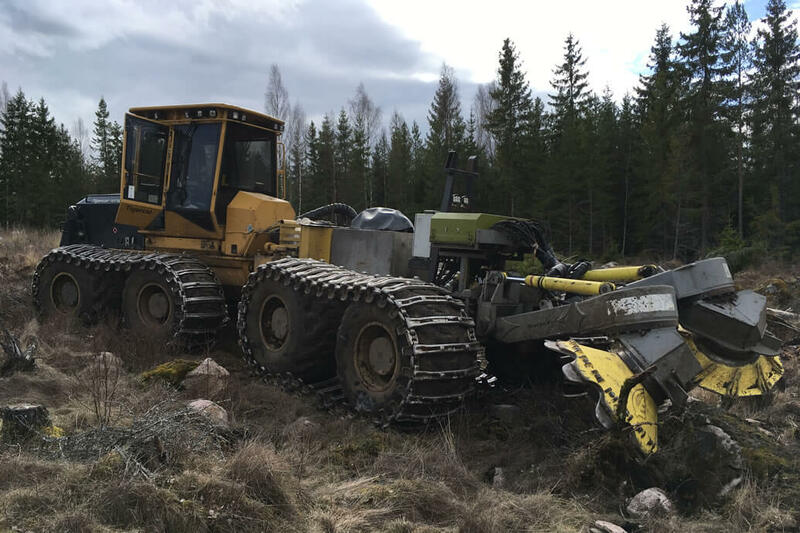 With the exception of the major fire in Västmanland, fires initiated by forest machines that result in the emergency services being called out correspond to 260–310 hectares of burnt land per annum, which is about 20% of all forest land damaged by fire every year. The ignitions normally occur during normal operations in the late afternoon. More than 90% of ignitions are dealt with by the machine operator using a foam extinguisher, water bottles or hand-held tools and are never reported to the emergency services. Those that cannot be dealt with by the operators themselves are usually bigger than forest fires in general and there is a clear correlation in their scope with the time from alarm until the emergency services can start their damage limitation work. Dry humus appears to be a key parameter for ignition compared with forest fires in general, aside from the general fire risk index (Fire Weather Index – FWI), which is calculated and forecast every day by the Swedish Meteorological and Hydrological Institute (SMHI). Another clear key parameter for the ignition frequency, comparable with a risk assessment based on the weather conditions, is the presence of boulders in cleared areas. 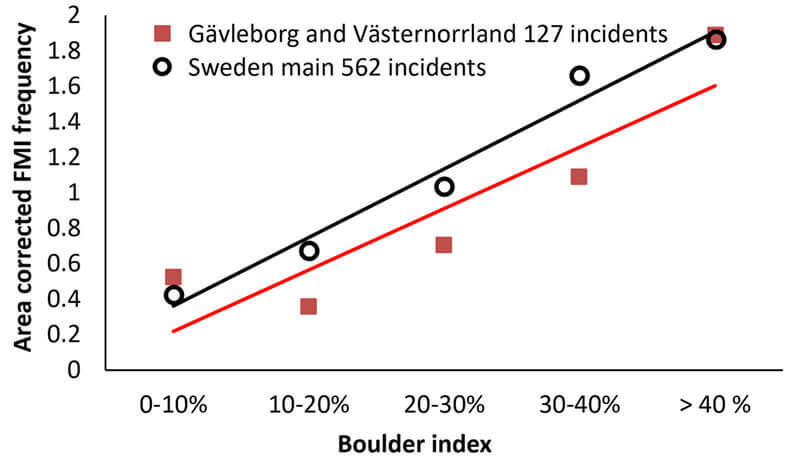 Correlation between ignition frequency and Boulder Index. The mechanisms behind the ignition incidents vary. The study finds examples of hot chips from the chassis protection steel torn off during contact with hard rocks as well as wheel tracks sliding against rocks and generating hot particles. Disc teeth in contact with stones also create frequent sparks and is considered to be the most common ignition mechanism, making scarification stand out among activities in forestry. Fires generally appear to start by smouldering before transitioning to flaming combustion. This transition can in some cases be significantly delayed (several hours to days), which means that there is a great potential for unrecorded events affecting the number and area of forest machine ignitions from fires where the cause cannot be determined by the first responders. The results in the study indicate big potential to limit the problem. First and foremost, the index in the fire risk system should be taken into account. Days with a FWI > 20, for example, accounted for more than 33% of all ignitions, but only occur on an average of 4–5 days a year in central Sweden. Other precautionary measures should be that there is always a box containing effective fire-fighting tools on the machines and to avoid rocky areas. The most cost-efficient method of reducing the problem is probably basic fire-fighting training for operators. This would help them to identify risk situations and also increase the chances of prompt extinguishing if ignition occurs. The study was funded by the Royal Swedish Academy of Agriculture and Forestry (KSLA), and the results can be accessed in the report entitled “Skogsbränder orsakade av Skogsmaskiner” [“Forest Fires Caused by Forest Machines”], RISE report 2018:35. More information about the fire risk system may be found here.